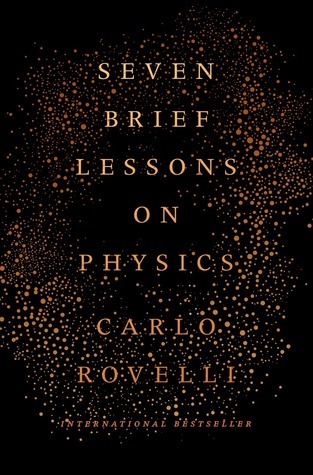 Seven Brief Lessons on Physics by Carlo Rovelli. Riverhead Books, 2016. 96 pages. Paperback/softcover. I recently received an ARC of Seven Brief Lessons on Physics courtesy of Riverhead Books, and I must say I was exceedingly excited to see this book when I opened up the package. I am fascinated by the theories of physics, but I don't think I was designed to excel in those areas, as I have always struggled with them - which is somewhat disappointing. This book, however, is meant to explain seven of the most prominent theories in physics in an entertaining and more approachable language than most physicists tend to write in. I felt like this was sent straight from the book gods to give me a second chance at understanding the basics of some important theories, and I intended to take this chance and run with it. This book certainly lives up to its title in its "brief" lessons. While I wasn't expecting too much depth within these lessons, they were even more abbreviated than I expected. The lessons are more accurately described as summaries rather than actual explanations. Based on this book, I don't feel like I was given enough information to have a completely grasp on many of theories because I feel as if Rovelli danced around the ideas without ever fully describing, but I do have a basic understanding of the ideas involved within each theory. At times, I must add that Rovelli almost attained a tone that sounded somewhat patronizing, as if he assumed the reader would have extreme difficulties grasping these ideas. This could be a positive aspect, but it could also be negative - it really depends on how you interpret it. Rovelli's writing itself is, however, quite lovely, and you can certainly gain a sense of his own wonder and appreciation of this subject. His prose is almost poetic at times, which adds a certain sense of beauty and awe to the subject, as well as makes the book approachable for just about any reader. This is a great book for someone who might be interested in pursuing a physics major or related career and wants to know the basic ideas that are involved. This was like a series of movie trailers meant to give you a taste of each theory, rather than going into much detail or explanations of the components of each theory. Overall, I'm giving Seven Brief Lessons on Physics four stars for delivering its promise of brief physics lesson in an enlightening and readable manner. If you're at all interested in physics and want to know only the basics, this is a great little pocket companion and introduction into the fundamentals of the subject.